Full-frame DSLR cameras used to be the preserve of professionals and well-heeled amateurs. But as competition has increased (and older models have been discounted as newer siblings arrive) prices have fallen to the point where they are within the reach of many enthusiasts around, which means that you're spoiled for choice if you're looking for a camera deal. And nowadays it is not just about DSLRs, there are some great full-frame mirrorless cameras too at affordable prices. That’s not to say manufacturers are giving them away for free, but there are full-frame camera bargains to be found if you’re prepared to buy a previous-generation camera, or sacrifice a little in the way of performance to get that large-sensor look. If performance is more important than price, though, head over to our best DSLR list. 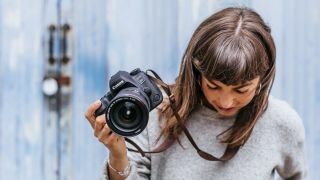 For the rest of you bargain hunters, we’ve put together this list of the 10 cheapest full-frame cameras on the market, from low-res options suited to low-light photography through to high-resolution cameras capable of recording big, detailed files. Whether you’re looking to upgrade from a cropped-sensor DSLR or something to rival the best mirrorless cameras around, or you’re considering changing to a different system altogether, this round-up will guide you to the best affordable full-frame bodies available. Best overall full-frame bargain The A7 Mark II is an impressive update to Sony's A7 – and is now something of a bargain. The original A7 is still available - and is better priced, so if you want the cheapest full-frame available go to that (see below). But the big advantage that you you get with the Alpha A7 II is built-in optical stabilisation – allowing you to get steadier shots in a wide variety of lighting conditions, and which operates with any of the range of E-mount Sony lenses. Autofocus and start-up times are also faster than those on the A7, the former thanks to a 117-point phase-detect AF system that works in combination with 25-point contrast-detect AF, ensuring sharpness no matter where the subject lies in the frame. This 24 megapixel CSC is also pretty small for a full-frame camera. Read more: Sony A7 vs A7 II vs A7 III: How do they compare? Best budget full-frame DSLR Arriving five years after the original Canon EOS 6D, the EOS 6D Mark II sees some significant upgrades over that model. As well as a step up in resolution – from 20.2MP to 26.2MP – it features Canon’s latest DIGIC 7 processing engine, a touch-sensitive, vari-angle display and 5-axis digital stabilisation for handheld video recording (which tops out at 1080p – no 4K option here). The autofocus system gets a healthy boost in the shape of 45 cross-type points, 27 of which are f/8 compatible, although the AF point array is weighted towards the centre of the frame. The system is sensitive down to -3EV and benefits from Canon’s excellent Dual Pixel CMOS AF in Live View and movies too. It’s a great camera to shoot with, and while we found the so-so dynamic range and the lack of 100% viewfinder coverage to be somewhat disappointing, the EOS 6D Mark II's combination of features, flexibility and value make it one of the best Canon cameras of all. Cheapest full-frame camera If the bulk of a ‘full-size’ full-frame DSLR puts you off upgrading, the small and lightweight original Sony A7 could prompt a rethink. Obviously, once you add a telephoto lens the A7’s size and weight advantage starts to slip, but it still packs a lot into a small body. The A7 was the first full-frame compact system camera on the market, and although it lacks some competitive features like touchscreen functionality and 4K video, the quality of the Raw images produced by the 24.3MP Exmor CMOS sensor continues to impress. The only real letdown is the somewhat poor battery life, but these days the A7’s relatively low price means that you can factor a spare battery or two into the total cost. The D610 carries on from the D600 - which kicked off Nikon's affordable full-frame DSLRs. Save for slightly faster continuous shooting – 6fps versus 5.5fps – plus a ‘Quiet’ 3fps burst mode and re-tuned auto white balance, the specs are the same. Thankfully, they are rather attractive. The spec sheet includes a 24.3MP FX sensor wrapped up in a fully weather-sealed shell, as well as a 39-point AF system that, while clumped at the centre, does include f/8-compatible sensors. Rounding out the package are dual SD card slots and an optical viewfinder that shows near-enough 100% of the scene you’re shooting. Best full-frame video camera bargain Its 12.2MP resolution might seem a bit 2002, but the full-frame CMOS sensor inside the Sony A7S simply shines in the dark. The ’S’ stands for ‘sensitivity mastered’ – and for good reason. The A7S has a native sensitivity range of ISO 100-102,400, but keeping the resolution low means the light-gathering pixels are larger and picture noise is well controlled. Video performance is high-end too, with full pixel readout on 4K video, S-Log2 gamma and clean HDMI output – although 4K recording is only possible via an external recorder (you’ll need to splash out on the A7S II for internal 4K). If low-light photography and video are your priorities the A7S is a good option, otherwise the higher resolution and stabilisation of the A7 II makes it a more capable all-rounder. The D750 is sandwiched between the more affordable D610 and the pro-spec D810/D850 in the full frame Nikon range. This ‘enthusiast-level’ DSLR borrows features from both cameras, so while it takes its handling cues from the D610, and shares the cheaper camera’s 1/4,000sec maximum shutter speed and 24.3MP resolution – albeit courtesy of a redesigned sensor – it packs an updated version of the D810’s 51-point AF system. The D750 is far from a Frankenstein’s monster of a DSLR though, and its accurate focusing and exposure, combined with welcome features like a tilting rear screen (a first for full-frame cameras), Wi-Fi and 1080p 60fps video make this an easy camera to live with. Now the higher-priced Nikon D850 is on the scene, the D810 scrapes onto our cheapest full-frame cameras list, although it’ll still set you back a tidy four-figure sum. The successor to the Nikon full frame game changer, the D810 takes the D800’s bar-raising 36.3MP resolution and… well, keeps the bar at the same height. The headline resolution figure may be the same, but the sensor has a new design, with Nikon ditching the anti-aliasing filter to maximise the amount of detail that can be recorded. Also upgraded is the processing engine – now EXPEED 4 – along with an improved 5fps burst rate at full resolution, enhanced 1080p video features and a new base sensitivity of ISO 64. The downside? The large file sizes mean that you’ll need a computer with enough horsepower to handle them – and storage can be an issue too. Most stylish full-frame bargain Up against the whopping full-frame resolution of the 50.6MP Canon 5DS/R, or the 45.7MP of Nikon’s own D850, the Nikon full frame Df’s 16.2MP resolution seems a little measly. But at least its sensor has pedigree – it’s the same one found in Nikon’s former flagship D4 DSLR – and the comparatively low pixel count means that it continues to deliver decent results in near-darkness. It’s what’s on the outside that’s more noteworthy. The Df’s retro styling borrows much from Nikon’s heritage and features a traditional dial-control layout that will please those who enjoy the photographic process as much as the end result. Compared with Nikon’s other FX DSLRs, the Df’s price remains stubbornly high for its specifications, but at least you can see and feel where your money went. In some quarters, Sony’s A7 and A7 II cameras have been regarded as poor relations of the high-resolution A7R editions. The A7 III buries that particular hatchet and, while it lacks the super-high megapixel count of A7R bodies, it’s a more consummate all-rounder. Headline attractions include built-in 5-stop image stabilization and a fast, deadly-accurate 696-point autofocus system. The combinations helps to ensure sharp shooting in almost any conditions. Meanwhile, the new-generation 24.2MP image sensor and processor team up to deliver squeaky-clean, low-noise images even at very high ISO settings. For indoor shooting under natural light, the A7 III beats any of the A7R series of cameras. And while it’s one of the priciest bodies in our guide to full-frame cameras, and the best Sony camera overall for that matter, it’s great value if you buy it as a kit, complete with Sony’s 28-70mm f/3.5-5.6 OSS zoom lens. Read more: Sony A7 III vs A7R III vs A7S II: How do they compare? A bargain at the price, the K-1 Mark II has professional-grade build quality with a full metal jacket and comprehensive weather-seals. It’s full of tricks too, with 5-axis sensor-shift image stabilization, GPS and an electronic compass all built in. The high-tech gizmos are put to work in clever ways, including an ‘astrotracer’ mode that works out where in the world the camera is, which direction it’s pointed in, and the level of tilt to the horizon. The image stabilization system then tracks the night sky during long exposures so that the moon, stars and other celestial bodies remain fixed in the image, rather than being reproduced as streaking lines. Another trick mode moves the sensor by incremental amounts through a series of four sequential shots. The results are combined into a composite, super-high resolution image. Sadly, the autofocus system isn’t quite so impressive and can struggle to track moving objects. The maximum full-frame burst rate is a mere 4.4fps as well, so the camera isn’t ideally suited to action sports and wildlife photography.